Despite this being a must-win game and the pitch having played well last night, @KarachiKingsARY have had a pretty sluggish start here. #PSLT20 Typical Test match start for karach kings... 31/0 in 5 overs. 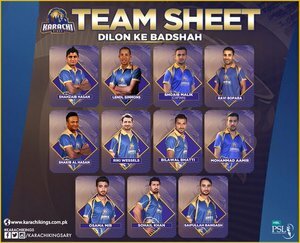 #KarachiKings are gonna win for sure now ???? And #LahoreQalandars will be out of #PSLT20 ???? #AbKhelKeDikha KRK 31/0 (Overs 5.0, Shahzaib Hasan 8*, Lendl Simmons 19*, 1st Innings) 19th T20 Match #PSLT20 #KRKvsPSZ "
#PSLT20 Shazaib gone . .